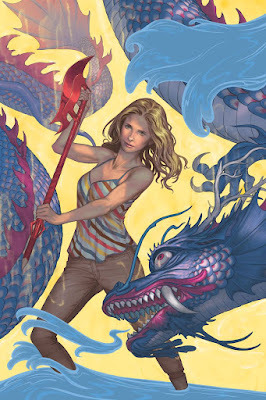 SAN DIEGO, Calif. — Dark Horse is excited to announce the next installment in Joss Whedon’s Buffy comics series, Buffy the Vampire Slayer Season 11. The talented comics duo of Christos Gage (Buffy the Vampire Slayer Season 10, Avengers Academy) and Rebekah Isaacs (Buffy the Vampire Slayer Season 10, Angel & Faith) returns with more shenanigans from the Scoobies. After overcoming the struggles of Season 10, Buffy and the Scoobies give themselves a well-deserved break from fighting evil. Unfortunately, the momentary peace comes to a screeching halt when a supernatural disaster wreaks havoc on the citizens of San Francisco, and the gang is forced to save the world from imminent doom, again. Buffy the Vampire Slayer Season 11 will have twelve issues total. The first issue goes on sale November 23, 2016. Karl Moline (Fray) will create a special Dark Horse 30th Anniversary variant cover for the first issue. Buffy creator Joss Whedon is signing on Saturday, July 23, 2016, from 5 p.m. to 5:50 p.m.in the Dark Horse booth at 2016 San Diego Comic-Con International. Christos Gage will sign from 1 p.m. to 1:50 p.m. on Thursday, July 21, 2016. For 30 years, Dark Horse Comics has proven to be a solid example of how integrity and innovation can help broaden a unique storytelling medium and establish a small, homegrown company as an industry giant. Founded in 1986 by Mike Richardson, the company is known for the progressive and creator-friendly atmosphere it provides for writers and artists. In addition to publishing comics from top talent, such as Eric Powell, Mike Mignola, Geof Darrow, Brian Wood, Gail Simone, Stan Sakai, and Guillermo del Toro, and comics legends, such as Will Eisner, Milo Manara, Kazuo Koike, Neil Gaiman, and Frank Miller, Dark Horse has developed its own successful properties, such as The Mask, Ghost, X, and Barb Wire. Its successful line of comics, manga, and products based on popular properties includes Dragon Age, Buffy the Vampire Slayer, Aliens, Conan, Tomb Raider, Halo, The Witcher, Serenity, Game of Thrones, and Avatar: The Last Airbender. Today Dark Horse Comics is the largest independent comic book publisher in the US and is recognized as one of the world’s leading entertainment publishers.